Please join us for our Annual Memorial Day Run in Hot Springs, AR as we honor our very own, Rick Franco. Rick was diagnosed with ALS, also known as Lou Gehrig’s disease, in the Spring of 2016. Since then he’s been a beacon of strength, optimism and humor for all of us. 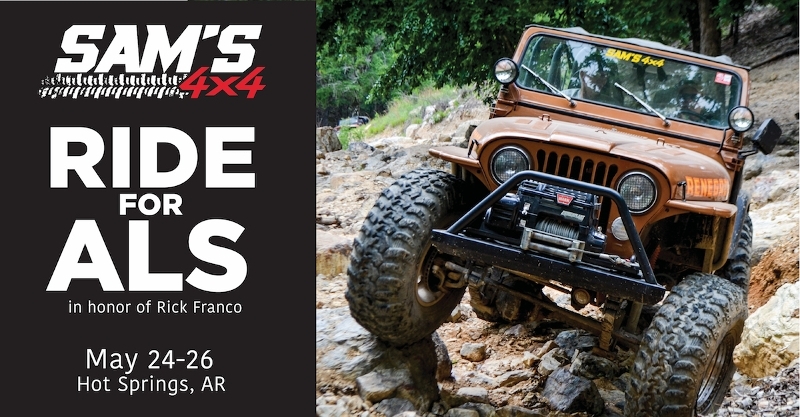 On Saturday after a day of four-wheeling, we’ll have a dinner honoring Rick and an auction and raffle to raise money for ALS Research through the MDA Foundation. We hope you’ll join us as we ride for ALS! In October of 2015, I was at our off-road event in SMORR when I found I could not button my BDU’s because my left thumb seemed very weak. Being a typical guy, I put off seeing the doctor until Feb. of 2016. Going in, I thought I had carpal tunnel, but was soon told that was not the case. After a variety of tests, the Dr. told me I had ALS with an estimated 3-5 years to live. Again, being a typical guy, my thoughts immediately went to “how can I fix this.” The Dr. told me, in no uncertain terms, there is no fixing this. The very next thought I had was “Thank you, God, for the life I have already lived.” I have been incredibly blessed with my family, my work, and my friends. One of my scriptures goes something like, “He will bring perfect peace to him whose mind is steadfast, because he trusts in You.” God has granted me that perfect peace and I thank Him for this and so much more. As my symptoms have progressed, I’ve become a big fan of the expression “more than one way to skin a cat.” I find myself daily finding new ways to do normal things, as my hands become less and less handy. Big thanks to my wife, who stands by patiently as I struggle with tasks, waiting for me to ask for help. My frequent response to her offer is “not yet” as I am determined to do all I can, as long as I can. Sharon is the rock on which I find my strength, my will, and my focus in dealing with this in the most positive way possible. Love you, Sweetie. I am very fortunate to be surrounded by folks who are willing to let me do what I can, as I can, and to provide help whenever I ask. Wayne has taken me to St. Louis, Mo. twice to have many more tests run to rule out possible mimic conditions that often cause an incorrect diagnosis. Not the case here, I have ALS and will fight it till the end. The upside being there are some fantastic Italian restaurants on “The Hill” and we have sampled a few of them. And yes, Wayne, I still remember that I owe you one for having missed dinner on one of our trips. The guys at the shop continue to razz me when I stumble or drop something, but they always help when I can’t open a zip lock baggy, or other things that I simply cannot do. (For the record, zip lock baggies are the devil)! I have often told them that if they quit giving me crap, I will just go home. But knowing they have my back is pure gold! I have two sons and seven grandkids. Again, being the fortunate guy I am, they both live close, and are always available for help, or just to come by and give me some company. I refuse to call their wives “daughters-in-law”, as they have always been considered “my girls.” My boys both did well, and again, I have something else to be thankful for. I have three brothers and one sister. To say they have been supportive would be the understatement of the year. Each individual has the ability to respond to a given set of circumstances in various ways. My response has been, and will continue to be, to see the good in all things. I am constantly amazed at the amount of good in the world, if you will just allow yourself to see and appreciate it. Take it from a guy with a new outlook on life, good is all around, we have only to recognize it. As I continue along this path I will remain grateful for all I have been given, and for the support of family and friends.